Hope most of you are aware of Nuget packages. It is a way to get 3rd party libraries into your project. Nuget also makes developer's life easier by checking for updates for all the available libraries. Apart from this Nuget also provides package restoration option, which is disabled by default. Another annoying thing about restoration is, it is very very slow. So, it means that until your restoration is complete, you can not do anything. What is the solution or workaround of this slow restoration of Nuget package ? Well, one workaround can be instead of restoring packages from Visual Studio, why can't we do it outside of Visual Studio. Interesting, isn't it ??? I have something very exciting to share with you all. Today morning, I received a mail stating "Congratulations! You have received MVP award”. At first I didn’t believed my eyes, but after reading a mail, finally I got a feel that I really won. Actually it was surprised for me too !!! But finally it happened. I’m honored to be a part of the C# community. It’s a privilege. MVP: MVP is an annual award given by C# corner to its community leaders who actively share their technical skills and excellent knowledge. This award recognizes exceptional technical community leaders who have deep understanding on some technology and how they can contribute to communities so that people around them can make the most out of them.Every day, around the world, MVP Award recipients contribute to online technical communities in a range of ways, including providing helpful answers, online discussions, translating online resources into local languages and serving as moderators. Continuing to my previous article on 'Customizing debugging session', we can further control on how properties and fields appear in our debugger window. Based on our debugging requirement, we can show and hide properties in our debugging session using one of the useful attribute named DebuggerBrowsableAttribute. How to hide unwanted properties during debugging session? What if a developer is not interested in viewing employee’s branch? 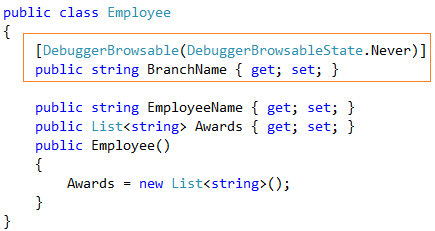 Is there any way to expand list of awards automatically in my debugger window? Hope you enjoyed playing with your favorite debugger window. 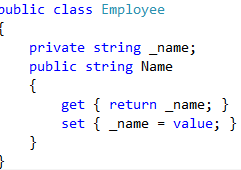 As its name communicate itself that when a source object’s property is null, then what is the alternate value you want to set for the target. So, whatever value is set for TargetNullValue, it will be set for target. Pretty simple, isn't it ? This is used when a binding cannot come up with a value at all, based on the the data source and the path. Or in other words, FallbackValue is used when the property binded with source is not at all available. In that case, value supplied to FallbackValue will be considered at the target end. Now, let’s jump on to the code on how to use both of these. 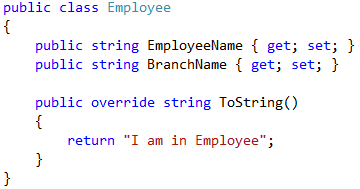 Here aim is to bind the given text box with EmployeeName property. Till this point, we haven’t done anything extra. It’s pretty simple and self-explanatory code. Let’s go ahead and quickly change the code a bit. Hope most of you have used StringFormat property on your binding to render the formatted value on the user interface. But are you aware about one of its secret. Well before revealing that secret, let’s have a look at how StringFormat works with binding. Scenario problem: I am taking an example scenario, in which my text box will display amount till three decimals. With above code, whenever you will lost focus from your TextBox, given amount will be displayed as three decimal points. Till here everything is perfect as expected BUT with one downsize. What one sees on the screen is not the actual value that will be stored in the storage and can be different from the underlined value. But if this is really a requirement on what we want to show to the user then it’s up to developer to manage such inconsistencies. Now time came to know about that GOTCHA. If you want to add UpdateSourceTrigger property = PropertyChanged along with your StringFormat, then guess what will happen??? To understand this issue, let’s go step by step. Step 1: Run the application and you will get below output. Explanation: Please note, you have applied UpdateSourceTrigger=PropertyChanged. So, as soon as you will hit a keyboard key, immediately StringFormat will be called due to change in target property and sets the underlined source property. Our source property raises a PropertyChanged event that forces the binding to re-bind and re-render based on the StringFormat. Problem occurs with fast input scenarios as shown in above screenshot and you will end up with RED rectangle. Reason: After each key stroke, it is re-rendering the value of a given text box. Explanation: As per the StringFormat property, given text box should be able to change the value to required precession. But it doesn’t happen. One should avoid using UpdateSourceTrigger=PropertyChanged with StringFormat, due to this re-rendering issue. 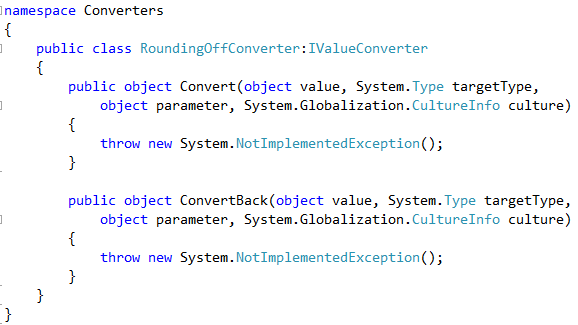 Converters give you a lot supremacy as it allows you to insert an object between a source and a target object. At high level, converters are a chunk of custom code that hooked up through the binding and data will flow via that converter. So, whenever data is flown from source to target, one can change the value or can change the type of object that needs to be set on target property. Data value: Here transformation will be done with just the value by keeping the data type intact. For example, for number fields, you can transform value to floating point number to an integer, by keeping the actual value as a float. Data type: One can also transform the data type. For example, setting a style based on some Boolean flag, this is one of the most common example. Isn't it? To implement IValueConverter, one has to create a class and then put the instance of that class in a ResourceDictionary within your UI. 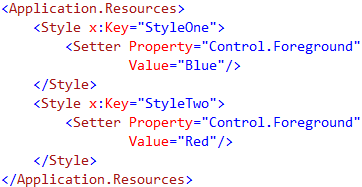 Once your class is part of ResourceDictionary, then you can point to the instance of converter using the Converter property of Binding, along with StaticResource markup extension. Before digging into the code, let’s discuss on what I want to achieve with below code snippet. 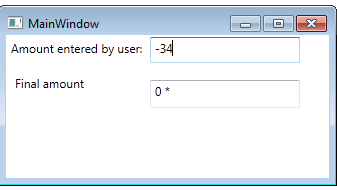 Whenever value entered by the user is negative, I want to display 0 with * as a final amount. In above class, Convert method will be called when direction of data flow is from source to target. value object is the one, which we are going to set here, targetType will tell you the type of target property, next is optional parameter and last one is for culture. ConvertBack method will be called when you have two-way data binding and direction of data flow is from target to source object. 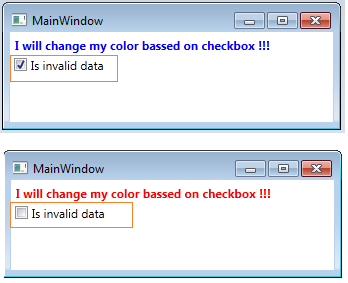 Code for using Data Type: Here aim is to select a style based on a Boolean property or in other words user want to change the color of a text box based on checkbox status. 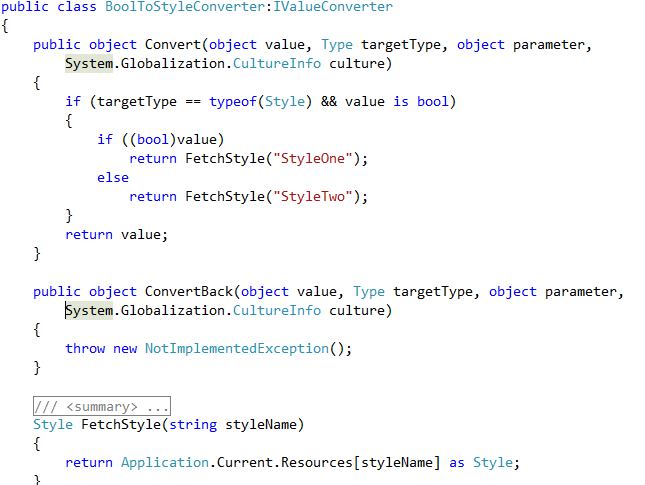 So let’s go ahead and write our BoolToStyleConverter. Hope this tutorial on converter was useful. 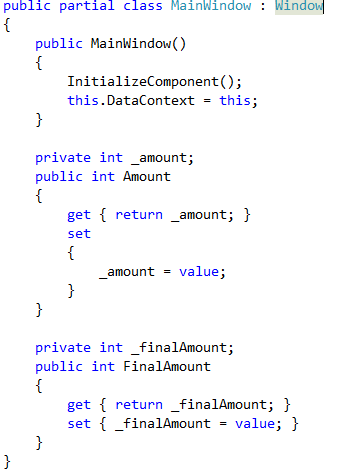 This is a property on a binding that controls the data flow from target to the source and used in two-way databinding scenarios. The default mode is when focus changes but there are number of other options available, which we will see in this article. Let’s talk about some of the data trigger scenarios. By default, modified values in the binding controls only get pushed down when we do activity related to focus change like tab out, minimizing and maximizing window, etc. · In some scenarios we want to update values as quickly as possible, or let’s say with every key stoke. So, to achieve such kind of scenarios Microsoft provided UpdateSourceTrigger. Explicit - Used to defer source updates until user do it forcibly by click on any button or so. Please note, as of now I haven’t done any binding on my textboxes. As a next step, let’s pick properties of UpdateSourceTrigger and see what each one of does. Default: When user will change value in Source textbox, value will automatically get updated in Target textbox. BUT when user will modify value in Target textbox, it won’t reflect in Source textbox, until lost focus happens. LostFocus: As I mentioned earlier, except DataGrid, LostFocus behaves same for all the controls as Default property. Here output will be same as above case (Default) as it is TextBox. PropertyChanged: If UpdateSourceTrigger property is set to PropertyChanged, then everytime both Source and Target will be in sync. In another words, updating Source TextBox will update Target TextBox on every key stroke and same proves true if value is updated in Target TextBox. After reading this article, hope you got a clear understanding on UpdateSourceProperty.